It may not have a protagonist called Link, had any involvement from Nintendo’s Eiji Aonuma or anyone from the Zelda team, but even though it is by no means an official The Legend of Zelda title, the second The Legend of Zelda game has arrived on the Nintendo Switch and its name is Oceanhorn: Monster of Uncharted Seas! When news of Oceanhorn coming to a Nintendo platform first broke, I was immediately overjoyed! Oceanhorn is just a fantastic title and since its initial release on iOS devices and various other platforms since, I had been waiting for the day it come to a Nintendo platform in my possession and this year the game did exactly that and it is just absolutely phenomenal. It is truly incredible to see what started out as a Zelda-like game on mobile devices, become playable on home consoles and remain the game we know and love it to be. Sure the art style could have been tweaked to make it even more so, but NO! Oceanhorn does have flaws, but the game is great, even the original version, but the Switch version is without a doubt the best version by far. The graphics have been HD improved but are true to the original and run at 60 FPS at 1080p and it really doesn’t matter if you play in Handheld or TV mode as a pleasurable gaming experience is guaranteed regardless. But let’s put all that stuff aside, because now it’s time to get down to all the nitty gritty details that are normal with a review, starting with this summary. “If Oceanhorn was a Zelda game, it wouldn’t be The Wind Waker because the two games are too different to compare, but it is Phantom Hourglass meets A Link Between Worlds because of the graphics, meets Breath of the Wild’s Divine Beasts, except in Oceanhorn they’re called Living Fortresses. It also has a story on the same level of Breath of the Wild’s and its story is what we’re going to cover first! 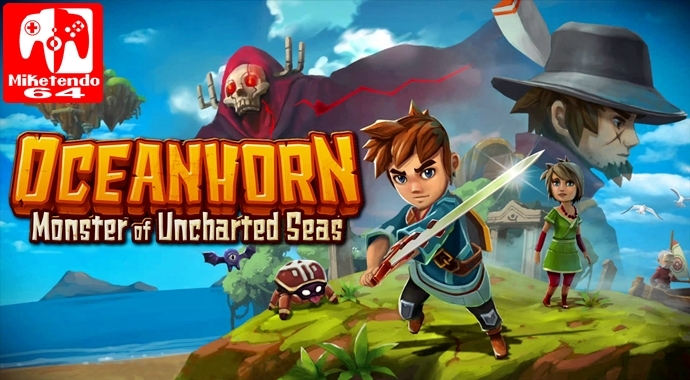 Well it is fun, and regardless of the fact Oceanhorn is a game that has been out since 2013, the story whilst having some sustenance that expands on the world it is set in, there isn’t all that much to it in terms of surprises, twists and turns, but hey, Oceanhorn was originally developed and released as a mobile title so what more do you expect from it? Plus let’s not forget that while story is something that makes a game sell, not every great game has a great story. Breath of the Wild is an exceptional game and I wasn’t exactly as wowed by it as I could have been. But story isn’t the only place Oceanhorn falls short. The voice acting isn’t as good as it could have been, as it feels very flat and emotionless at times, but the descriptions the protagonist provides when arriving at a new island, can be enlightening at times, but while the voice acting does in deed fall short, the soundtrack sure as hell doesn’t. Oceanhorn has such a great soundtrack, but then it was composed by Kalle Ylitalo, with a couple of compositions provided by Nobuo Uematsu and Kenji Ito. But that’s enough about the games sounds, let’s talk about the actual gameplay! You can also pick up pots and throw them, only they don’t drop Rupees, but Coins which can buy you all kinds of things from the shops available in the game and one item particular is a Heart Container. There are also Heart Pieces that can be found all over the world and four of them will form a new Heart Container. Once your first spell is acquired, a mana bar is given (aka a magic bar), grass can be cut with a sword, as can enemies and projectiles can be reflected with a shield, and you can roll! Granted you actually need an item that will let you roll (clearly missing in Breath of the Wild,) but you can roll and there are even side-quests in the form of challenges. Challenges which consist of various things from earning so many coins, to spending 2,000, to performing a Spin Attack and you will want to complete them as every challenge does count towards your overall completion tally. Plus they help earn EXP, which allows you to level up and get certain perks like being able to use a gun whilst sailing and being allowed to carry more bombs and arrows. Plus the world exploration is a lot like that of a Zelda game as well as there is a whole lot of backtracking to be done, exquisite dungeons packed with puzzles that are very reminiscent of those seen in earlier Zelda titles, plus there is an open sea that begs to be sailed up. Sadly though the sailing isn’t as good as it could have been as you have no real control over it like you do in The Wind Waker and Phantom Hourglass. Instead all you can do is set a destination and then wait for the boat to sail there, whilst firing at whatever you desire to shoot, should you have reached the point where you unlock it via levelling up, but I would have preferred to been able to actually sail as the lack therefore does the game no favours. When first playing it, albeit some of the islands are very small and easy to complete and rob off their bloodstones, but when taking to the sea for the first few times, the world of Oceanhorn feels vast. Expansive and open, but when you spend enough time at sea, you realise the openness is a lie. All you can do is go from A to B, to E, but had you been able to sail yourself, although there is a set number of islands, at least you could attempt to sail away into the sunset only to have some sort of barrier stop you. Regardless of all that though, Oceanhorn is a fantastic title that deserves to be played on all platforms and the chance to grow into something so much more than what it is now and because I will literally talk your ear off as far as Oceanhorn is concerned, we’re going to skip the chaff and fast forward to the conclusion! Zelda rip-off or not, Oceanhorn is still a great game in its own right. A game that set the bar as to what a Zelda-like experience on mobile devices should be and like I already said, it is just perfect on the Nintendo Switch. I love it, I can’t get enough of it and I hope to hell Oceanhorn 2: Knights of the Lost Realm also comes to Switch, because I certainly need more Oceanhorn action in my life. So because I don’t want to postpone it any longer, I’m giving Oceanhorn: Monster of Uncharted Seas a well-deserved 9/10. Thank you FDG Entertainment for making my Oceanhorn Nintendo release dreams a reality and thank you Cornfox & Bros. for making the game in the first place. It goes without saying, this is a game that I recommend to everyone with a Nintendo Switch because it really is that good! I like to think that by buying the game on Switch helps support the developers in their development of the sequel (which there is) to continue building up the wonderful world of Gaia in Oceanhorn. Different games appeal to different people and for me, I instantly gelled with this game. But everyone is entitled to their own opinion.